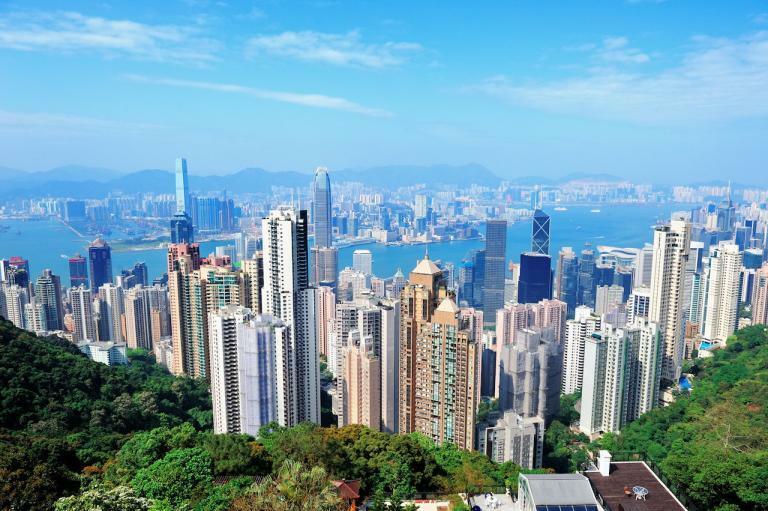 Mike Zamora is Managing Director for Asia Real Estate Advisors, currently based in Hong Kong, where he has been involved in many different aspects of real estate throughout Asia, Europe and the U.S. 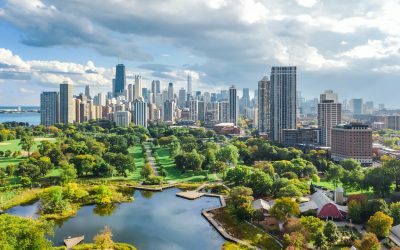 Many cities in the U.S. and around the world have started the process of transformation from analog to smart and sustainable. The process tends to start with the implementation of a series of independent infrastructure systems connected to a digitally linked network. Yet, the transformation process for cities is still in its early stages. Many cities and communities have taken different approaches. There are many different components and systems for a city to choose from in deciding how and where to start. Transformation also requires the involvement of various players. This article discusses the players and the evolution of cities as they race to be Smart & Sustainable. The overall goal for a smart and sustainable city is to provide a lifestyle and environment which is effective, efficient and enjoyable. There are many different ways to approach this goal. It becomes a function of how active each of the players becomes and the community’s geographical assets and constraints. The initial dimension to consider is the players. There are four predominant player groups: People (Citizens), Business, Built Environment (the people who develop and own buildings), and the Government. These four groups are the main players in any city or community. They each have different roles, goals and responsibilities (see Diagram 1 below). There might be distinct interactions in which two groups overlap. 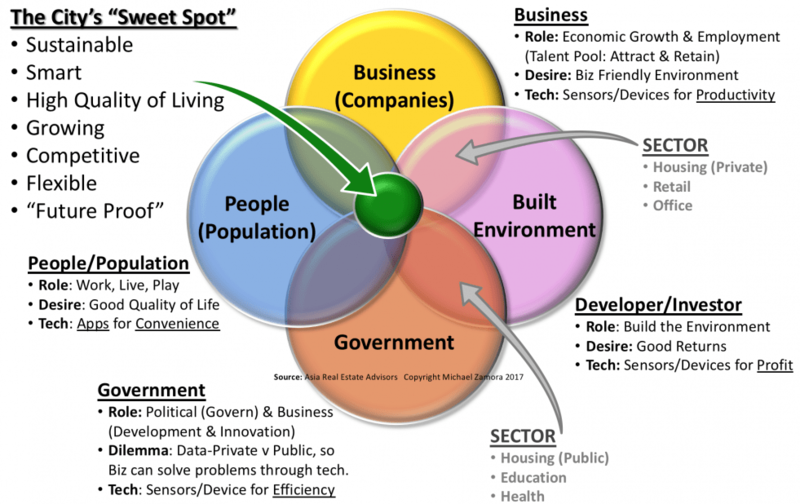 When all four players work together in unison, the outcome becomes a sweet spot: a smart and sustainable city. When one or more of the groups aren’t involved, then the outcome is very different. As with any group, there needs to be a team leader. In many communities the team leader is the local government. The team leader is not responsible for funding or doing all the work, they are simply the facilitator to initiate teamwork among the players. In some instances the government does not always take this leadership role or is not effective. In these cases, Citizens fill the leadership void as they have a material vested interest. Another dimension of the smart and sustainable City is how they evolve over time. There are three main phases. The initial phase (v1.0) is the Awareness phase which is led by technology companies. The second phase (v2.0) involves the government taking the leading role. The final phase (v3.0) has the citizens assuming the lead role. Let’s cover each of these in a little more detail (see Diagram 2 below). In v1.0 the technology companies provide awareness to a community, in order to convey the benefits of their respective product or system to improve the overall environment. This stage is important as it makes the other players aware (government and citizens) and helps them start understanding the benefits of smart infrastructure systems. 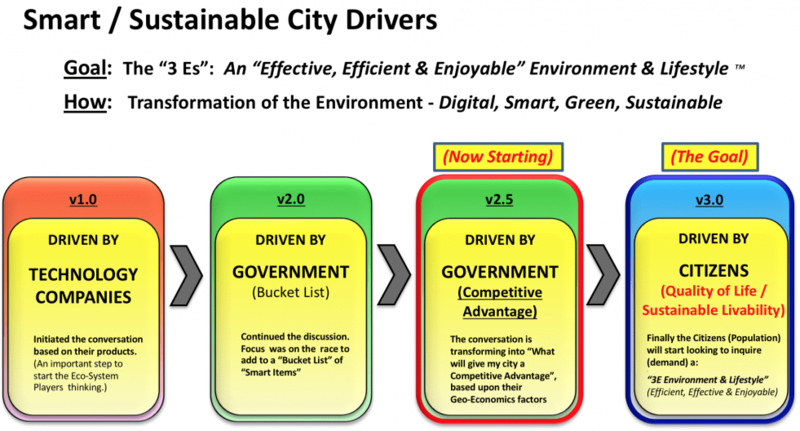 In v2.0 the government becomes aware of the greater benefits for their city and community. In this phase, many governments start implementing infrastructure items in a laundry list manner. Most of the time, they simply implement as many items as possible. This is also an important stage. It makes local officials aware that a better environment for its citizens and business community is possible, which facilitates government involvement. In this phase many cities start to compare themselves to each other in a sort of competition. However, they have not yet developed a focused plan for their city based upon its particular competitive advantages. Many advanced cities have entered this stage. The next phase covers this in greater detail. 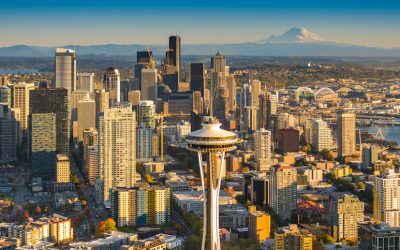 Think of the next phase, v2.5 as a version in which a city assess its competitive advantages to try to better understand the best course for its citizens and business community. It begins a holistic approach to decide what will be needed. It is also a process to help establish the necessary prioritization for the next steps, since there are of course limited funds and resources. There are not many cities in this phase. The final phase is v3.0. This is when the citizens start to take control of the process with the support of the government. The citizens break the city into communities or villages, each having their own distinct attributes and requirements. There are even fewer cities at this level. So now that the various phases are more fully described, let’s circle back to V2.5 and the city’s self-assessment. At this stage in the process, the city undertakes an honest evaluation of itself in a gap measurement approach (see Diagram 3 below). This process is based on four main categories: Geography, Economy, Government, and Knowledge. These four areas will form the basis for understanding the differences between the current status and the potential future status. Geography will take into account the proximity to other areas, transportation, availability of additional land for growth, and the general topography. Economy will consider the economic system and how transparent it is, access to skilled labor, ability to produce goods and services, access to finance (banks, venture capital and/or capital markets); and finally, access to information. Government will include the legal system, local officials’ openness to ideas and changes, and willingness to get involved. This statement regarding government willingness is a reference to the earlier discussion of the importance of government involvement among the various players in the transformation process. The final category is Knowledge. It is the access and availability to good learning institutions (ranging from K through post-secondary), as well as the community’s appetite for Innovation and entrepreneurship versus a desire to maintain the status quo. 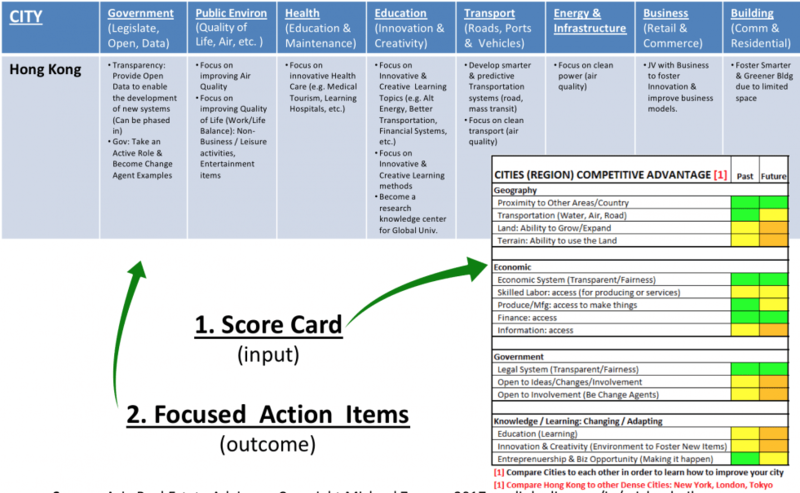 Once a candid and honest scorecard is completed the city can begin to assess its relative strengths and weaknesses in each category. The goal then would be to emphasize its strengths, and determine whether any of the weaknesses can be easily addressed and transformed into future strengths. Then the city can apply these strengths (competitive advantages) to its various components. Examples of these could include: Government, Public Environment, Health, Education, Transportation, Energy & Infrastructure, Business, and Building Environment (See Diagram 4 below). 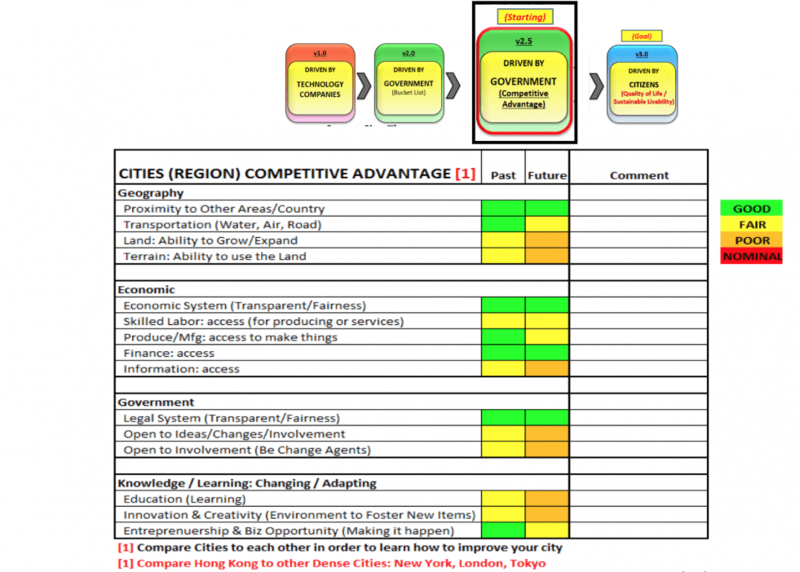 Using the city’s strengths, a list of components for each category can then begin to be populated to decide what could be done to the city based upon its competitive advantages / strengths. 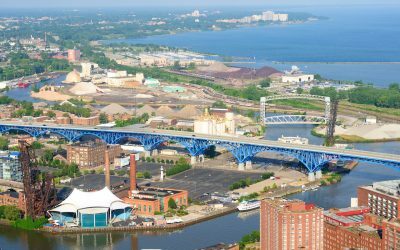 This list can then be evaluated to determine which items would be best for the city; then these can be prioritized and planned out over multiple years. This becomes the city’s roadmap or blueprint to becoming a Smart & Sustainable City. It is based upon what is best for a city’s particular attributes. The roadmap then allows the city to match its needs and desires to its budget. It also allows a way for the city to convey the plan to its citizens in order to gain acceptance. This approach enables a city and its four key groups to understand the direction and the implementation for their city’s future. While no one can know for sure the direction of a city, the involvement of all the groups and having a process for implementation enables the city to have a better chance to become an effective, efficient and enjoyable environment for all for many decades and even centuries to comes. Now that truly is a sustainable city. It is an inspiring article. I wonder for Version 3.0, what qualification or knowledge is required for the citizen?